There it is again! Fast food Friday. On Friday I post a delicious recipe that has something to do with fast food. It must be ready quickly, or the ultimate fast food. Such as pizza. With the famous Margarita pizza (which can be written in many different variations) as the best known variant. But with pizza you can do so much more. For example, think of the pizza with Parma ham, arugula and pine nuts, one of my favorite variants. But I still have a few more. 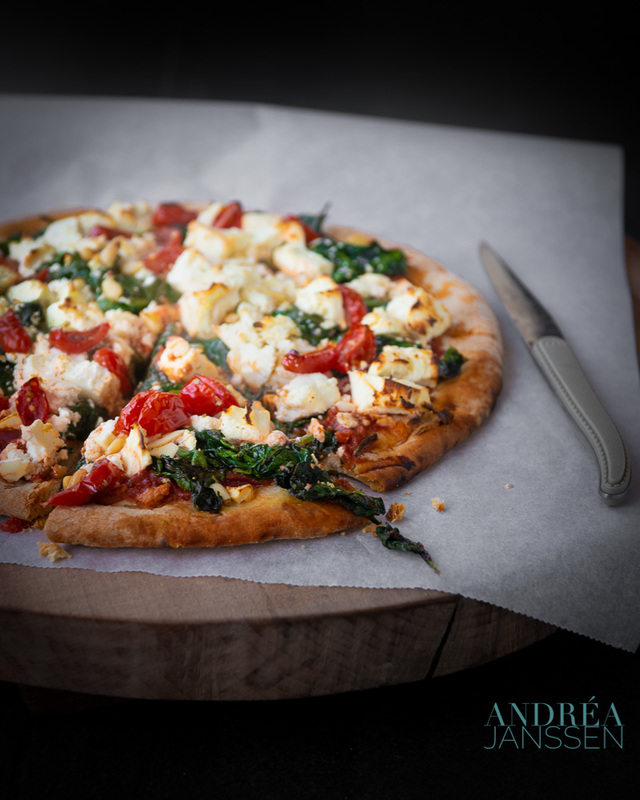 For example this pizza with spinach, feta and pine nuts. Basically just a pizza with everything that I like as a topping deposited on it. Do I always make the pizza bottom myself? Sometimes like the pizza with Parma ham, arugula and pine nuts I do. But I can also get away with a ready-made bottom. I always make my own sauce though. Because I just like the flavor that much better. I tried most variants from the supermarket, a sort of comparative commodity study, but THE pizza sauce was not included. And it is made so quickly that I actually always take the trouble. For the topping, I chose spinach and feta this time (because I think that is also a wonderful combination and I used it multiple times as for example with the spanakopita). Because of the nutty flavor, pine nuts fit well with that. And of course some extra cherry tomatoes for the extra bite, I simply can’t resist them. All in all a delicious pizza. I think quite a lot healthier than the store bought variants. Chop the onion and the garlic finely. Heat the olive oil in a saucepan. Bake for 3 minutes or until the onion are translucent and then add the passata and sugar. Place the herbs on top of the sauce and bring to the boil. Then lower the heat and let it simmer for 10 minutes, stirring occasionally. Remove the herbs from the sauce and taste. Put the bottom in front of you. Smear the pizza dough with the sauce. Heat 1 tablespoon of oil in the pan. Wash the spinach and stir-fry it with adjacent water for 2 minutes. 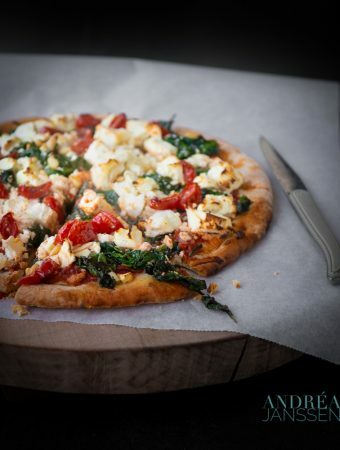 Spread the spinach and the feta on the pizza. Halve the cherry tomatoes and spread them over the cheese. Sprinkle some pine nuts on top. Bake the pizza in the oven for 15 to 20 minutes. A delicious healthy recipe to start the week with. And ready in the blink of an eye. Certainly if you bake the sweet potato in the oven the night before. 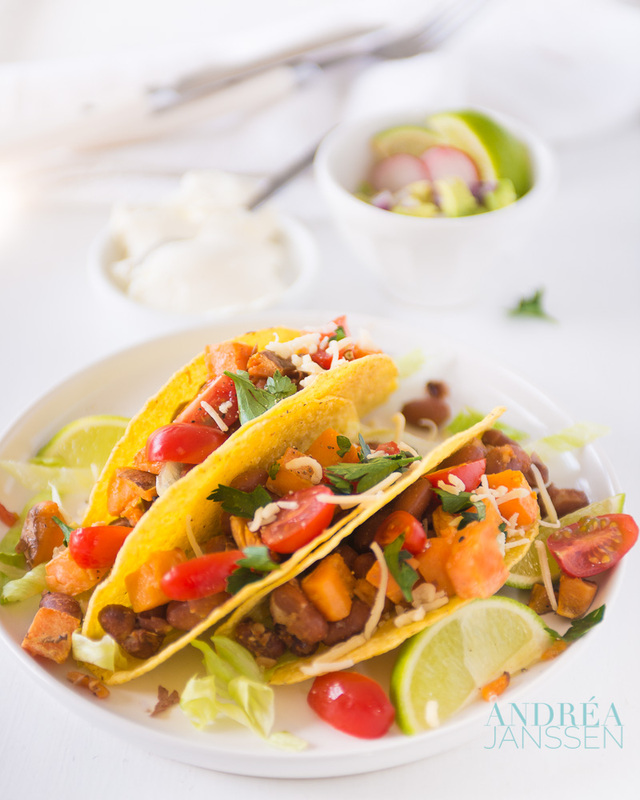 Then these tacos are ready to be served in a few minutes. Inspired by a cooking show on Netflix, called the Final table, I ended up with preparing these tacos. The Final Table is in fact a show in which 12 duos start and only 1 will be the winner (yes, that concept has of course been donebefore), but the great thing is that they are going to prepare specific recipes from a country. With the cooks own twist. And the first country (but you probably guessed it already) was Mexico. The 12 teams started with tacos. And they came up with a lot of variations, I was literally mouth watering. There were very culinary creations, but also very simple ones. But they all sounded great (although the jury found that a few were disappointing if you actually ate them). So I just sat down and asked myself how I would make a Taco with a twist. For example if I would go on a vegetarian tour. And now it seemed like a good choice to use sweet potato as a base, combined with kidney beans. Nicely flavored with herbs and finally mixed with cherry tomatoes. And I understood from the series that a salsa (with pepper, that is very important) should always be a part of it. To spice up the taco, I opted for creamy avocado, peppery radish, pepper and a red onion. Flavored with a hint of lime. I don’t know if I would go to the next round in the actual show, but it was tasty. And it looked beautiful. Cut the avocado, onion, pepper, garlic, herbs and radish into small cubes and mix well. Season with salt, pepper and lime juice. Store covered in the refrigerator until use. Line a baking sheet with paper. Spread the sweet potato on the baking sheet and sprinkle with the olive oil. Put the plate in the oven for 15 minutes. Meanwhile, heat the oil in the frying pan. Fry the onion in about 3 minutes. Mix the garlic and stir-fry for 30 minutes. Add the kidney beans and the spices. When the sweet potato is ready, mix it with the beans. Then mix in the tomatoes and herbs. Heat the taco shells until they are crispy. 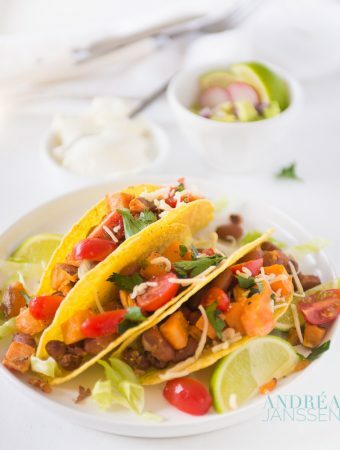 Place some iceberg lettuce at the bottom of the taco shells. Add the sweet potato mixture. Sprinkle with coriander and season with lime. Sprinkle some cheese on top and serve with the salsa and crème fraîche. Today, we ate a vegetarian dish: a delicious frittata with broccoli. Nicely flavored with herbs and vegetables. Delicious cooked in the oven. With pasta (fussili) that was flavored with herb dressing and a salad. It became a real nice dinner. Grease a small baking dish. Cut off the broccoli florets and grate the stem. Put the florets in a saucepan with water and bring to a boil. Cook for 5 minutes or until broccoli is al dente. Chop the onion, garlic, thyme and rosemary needles finely. Cut the mozzarella into cubes. Heat oil in a frying pan and fry the onion for 3 minutes until it looks translucent ( not brown ), add the garlic and 1 teaspoon pepper oil and fry for 1 minute. Turn off the heat. Stir in the broccoli, grated broccoli and half the mozzarella cubes and mix. 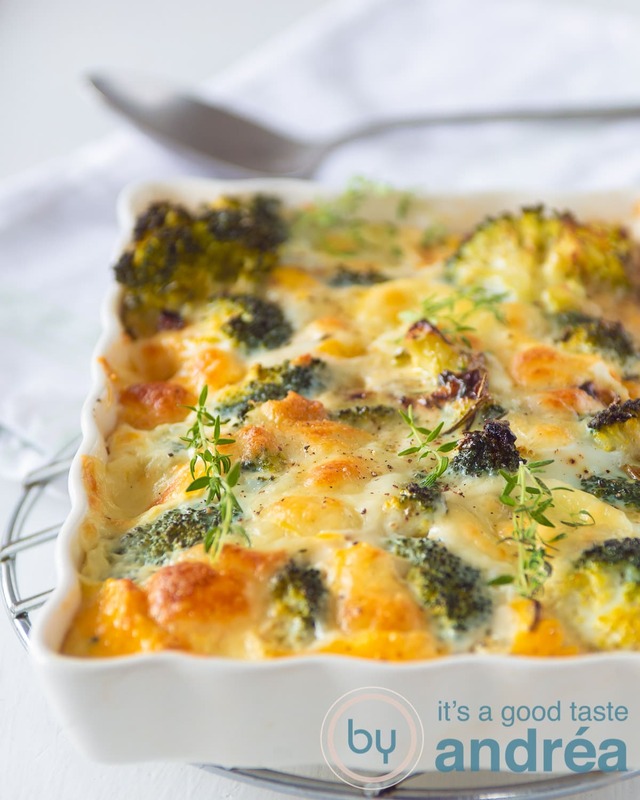 Break the eggs on top and mix with the broccoli mixture. Season with salt and pepper and put into a baking dish. Sprinkle with the rest of the mozzarella and place in the oven for 30 minutes until golden brown. Oops, I was busy taking pictures when glass became flying around. Accident or oversight on my part. But nobody was hurts so the damage is not too bad, although again a dish less. That makes a good excuse to go shopping again real soon for new props (my cabinets aren’t already bulging out enough 🙂 ). 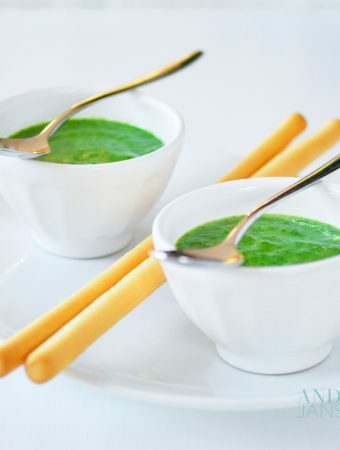 Because of the spring, the birds are singing and the sun is already warm, today a real spring soup. The recipe comes from the cookbook Eat with family and friends of Sarah Raven and that really is one of my favorite cookbooks. Seasonal food and not too difficult recipes. 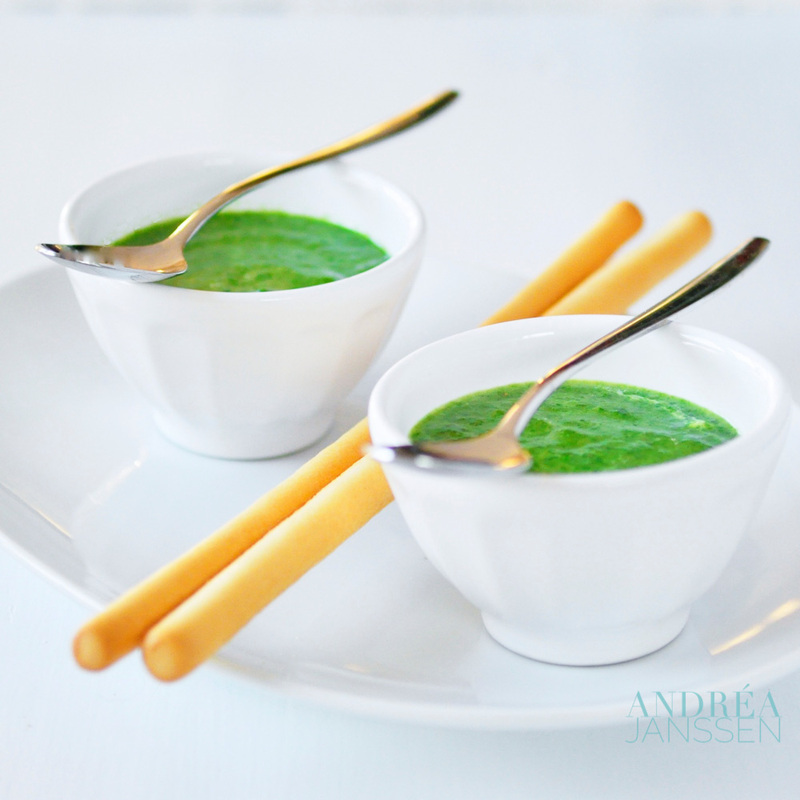 These rocket spinach soup is really a season topper . Both veggies got plentiful harvest in the spring. And the creamy spinach, along with the pepper of the rocket makes that this really become a delicious recipe. salt and pepper at taste. Cut the potatoes into cubes of 1 x 1 cm. Fruit onion in a pan in which you melted the butter and added the olive oil. Turn the heat to low and braise for about 3 minutes. Add the garlic and stir fry for another 1 minute. Add the broth and potatoes and bring to a boil. Let simmer for 20 minutes, then add the spinach and rocket. Simmer for 1 minute and remove the pan from the heat. Puree the soup in a blender or in a hand blender. Mix the creme fraiche through and season at taste with nutmeg, salt and pepper. Heat the soup, but making sure it does not come to a boil. How fortunate I was cooking from the blog Lieziepeasy from Annelies for this months foodblogswap. Her blog (only in Dutch) contains delicious dishes that are nicely divided by category. And what a recipes: first I doubted about chopped figs with pecorino ( it sounds delicious), then the Indian curry with cauliflower (but that is such an obvious choice) and that’s when I saw them: the Hasselback potatoes . That recipe I have on my to do list for so long. The fact is that my husband is a real potato eater . He would like to eat it every day, in his case especially the boiled potatoes ( or not fired ). For me that is way to much. 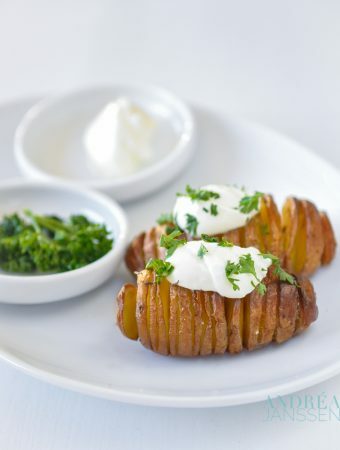 I do not want potatoes every day (max is up to two or three times a week) and also the simple cooked version is not really one of my favorites. I’d rather loved diced cubes, oven fries, rosti and potato pancake or baked potato. But after this delicious recipe there is another variant which I’m going to make: the hassel backed potato (also approved by my husband!). Tasty crispy outside with a lovely soft creamy inside. Put the olive oil in a small pan with butter and put it on low heat until the butter has melted. Cut the potatoes until it reaches 1 cm above the bottom in slices as thin as possible. Brush the potatoes with the butter / olive oil and place in the baking dish. Put the baking dish in the oven for 30 minutes and brush again after 30 minutes with the butter / oil mixture. Put the dish back in the oven for another 30 minutes. Remove the bowl, brush again with the butter / olive oil mixture and sprinkle with fresh thyme leaves. Get the dish back in the oven for 10 minutes and serve. 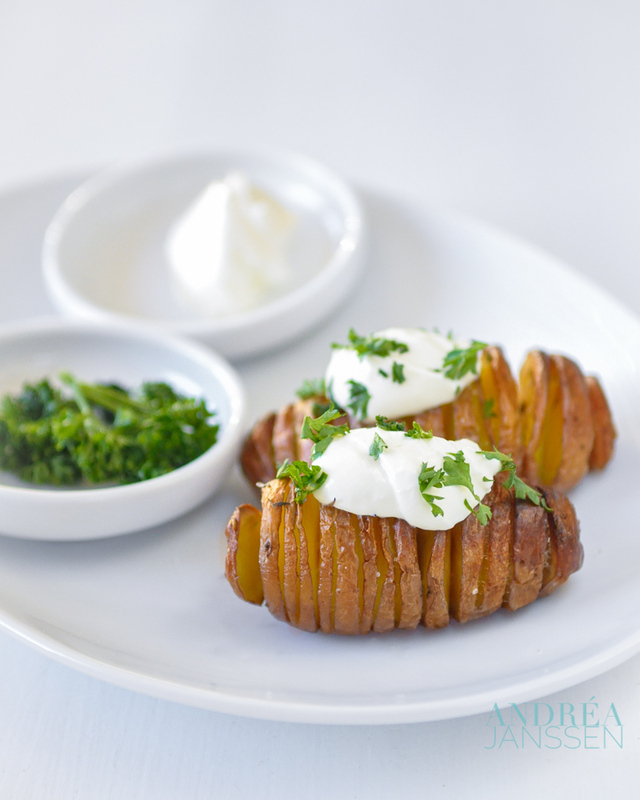 It is wonderful to garnish the potatoes with sour cream and chopped parsley, although they are also delicious au Naturel! After the sweetness of the tiramisu it is also nice to have a salad for a change. But after such a delicious tiramisu , it better had to taste good. Today a salad without sugar and meat, but with a slightly sweet bite . That’s because of the added date vinegar, which brings the dressing to a slightly sweet taste anyway. And that blends perfectly with the sweet pear, sour apple, nutty pistachio, the peppery arugula and salty cheese. When you take a bite of the salad, you will get a true taste explosion in your mouth. And that’s good. Very tasty. I ate it as a lunch salad, but it is also very delicious as a side dish or as a salad served at a barbecue . The recipe of today fit perfectly into the theme of the cooking evening: Italian. My time in picking garden was thus somewhat limited to picking, but that was just as well. It even hailed in this part of the country . When you looked at the weather you could have predicted the weather wouldn’t be that great. The sky lit so threateningly against the trees . And the wind was chilly and harsh. In the kitchen we weren’t that affected, it was warm and cozy. Chill. Wash the arugula salad well. Peel the pear, remove the seeds and cut into small cubes. Wash the apples well and remove the core. Make the dressing by mixing the vinegar, olive oil and mustard. 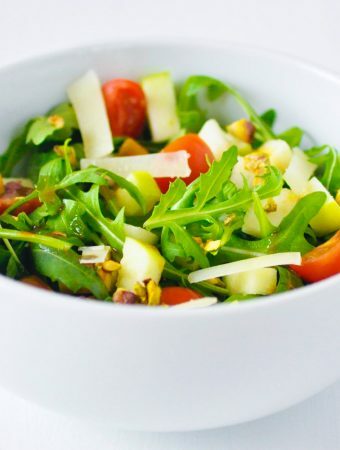 Put the arugula in a bowl and mix the tomatoes, apple and pear in the salad. Mix the dressing through and sprinkle with pistachios and cheese. What I really do like in summer is a Caprese salad. 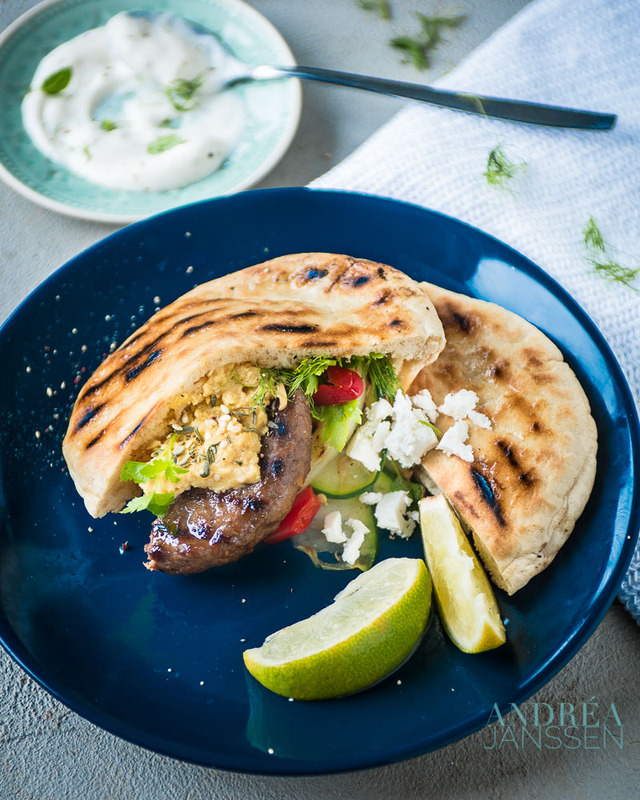 We eat it often when the weather is warm on a baguette , lunch or as an accompaniment to the barbecue. But what I like better for spring , autumn or winter is to use this salad as a base for a nice filled baguette. Delicious on Sunday afternoon when relaxing, but also great to eat with a soup . Use enough salt and pepper as seasoning, because the Mozzarella and tomatoes that you use could use a little pizzazz. Cut the baguette diagonally, not through and through, about 2/3 depth. Crush the garlic cloves in a small bowl and mix with 3 tablespoons of olive oil. Grease the olive oil/garlic on the cut surfaces. Cut the tomatoes into thin slices. Seize the mozzarella apart and put it with the tomato into the notch. Chop the basil finely and put half of the basil with the tomato and mozzarella. Sprinkle the top of the bread with olive oil and season with plenty of salt and pepper. Put the bread in the oven and bake for 15 minutes until golden brown at 225 degrees Celsius. Sprinkle after baking the baguette with the other half of the basil. Serve. Today on Carnival Sunday a delicious kale recipe. And a great dish for Carnival because kale makes a good base and that is necessary for a full day of celebration! A delicious vegetarian casserole, where you don’t even miss the meat. The crunchy and rich cheese layer and the creamy kale potato mash will do the trick. This is an easy recipe to make and always will be a winner. Peel the potatoes and cut the kale finely. Bring a pan of about 10 cm water to the boil. Cook the kale and potatoes together in the pan with boiling water until done in about 20 minutes. Meanwhile, cut the cheese into small cubes and the dried tomatoes into strips. After cooking the potatoes mash them finely. Add the soy sauce, diced cheese and dried tomatoes and stir through. Put the mixture into the baking dish and sprinkle with grated cheese. Put the dish in the oven for 15 minutes, until the cheese is melted. Last week we had Running Dinner. That’s the way it’s called at least with us, because I’ve seen several variations on it. In any case, it means that you eat your starter, main course and dessert at a different location. Where you are always sitting at the table with other people than the last meal. And you’re ought to take care of the starter or main course or dessert. Both the starter and the dessert are the easy ones I think. Because for the starter your guests come to you, but you are already at home yourself. That means in most cases an ideal preparation time. The dessert can often be made well in advance and in the extreme case you serve a delicious cheese plate and the preparation time (after shopping after) is nil. But lucky me, I got the main course. Extremely exciting because you come from a different location and have about 20 to 30 minutes to put something on the table. And that requires some thorough planning. This time my menu consisted of delicious deer beef with bacon (well pre-prepared, just takes a minute to grill), with green beans rolled in bacon (just a little oven time) and red cabbage from the slow cooker. And then the potato dish. I decided, because the haricots were also in the oven, to make a gratin, which I “pre-baked” for an hour in the afternoon so that I just had to bake it in the oven for 30 minutes in the evening. Fortunately, I can say, afterwards, that it worked. Everything was warm and on the table at the same time. So again a challenge completed. And do you have such a challenge soon? Perhaps this potato gratin (or one of the other recipes) works fine for you too. 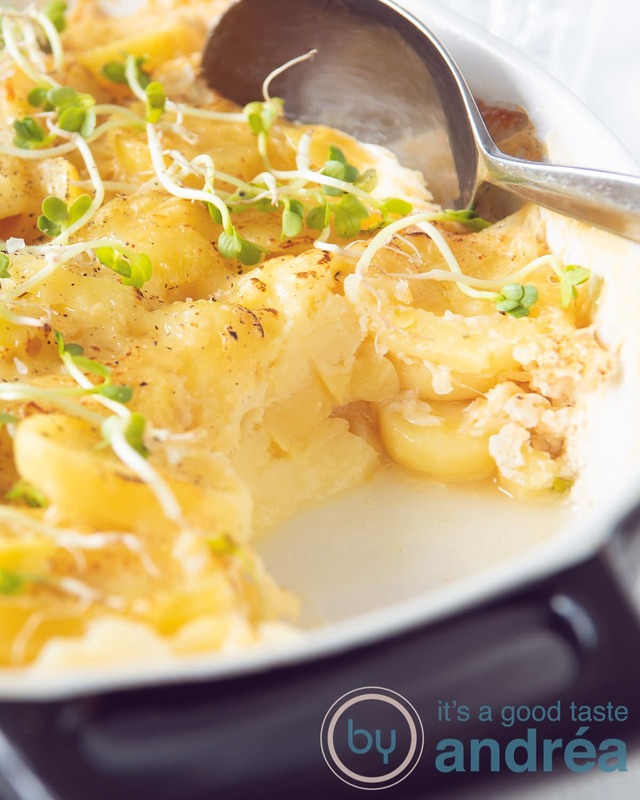 This potato gratin is much slimmer than the classic version because whole milk is used instead of cream. But it will also will tast great when prepared with semi-skimmed milk. Use enough salt in this recipe. By using the milk, the salt taste is slightly softened and otherwise it quickly faints. Do you have a dinner just like me and do you have to prepare this recipe in a short time? Make the potato gratin and bake it for 1 hour in the oven at 200 degrees Celsius (under an aluminum foil). Place in the refrigerator until use. When you need it, remove the aluminum foil and bake it for another 30 minutes at 200 degrees Celsius. You can prepare this part of the recipe the day before. Butter an oven dish with 1 tablespoon of butter. Peel the garlic clove and cut it in half. Rub the baking dish with the sliced ​​clove of garlic. Divide ⅓ of the potato slices over the bottom. Sprinkle with ⅓ of the cheese and season with salt and pepper. Repeat this 2 more times (first a potato layer and then top with the cheese). Carefully pour the milk into the oven dish. Divide 2 tablespoons of butter into small parts and place them on the top layer. Put an aluminum foil over the baking dish and put it in the oven for 1 hour. Remove the foil from the dish and let it cook for another 15 minutes, so that the top layer of cheese becomes nicely browned. 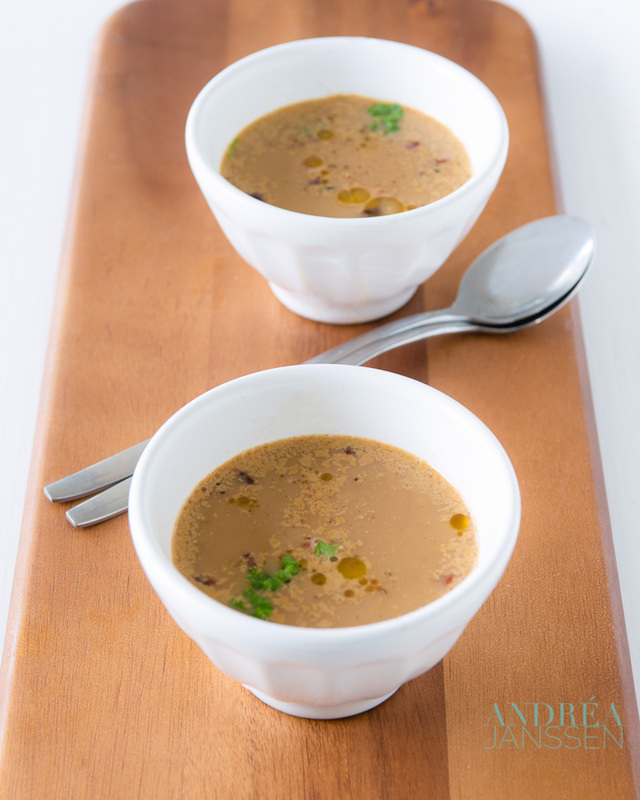 This month we are challenged by CuliSandra host of this months foodblogevent to make something of our bucket list. That’s a list of recipes that you want to make for a long time, but you just didn’t make the time. And yes I also have a bucket list and on top was Foe Yong Hay (or Chinese omelette with sauce). You can get it at the Chinese as a take out dish. 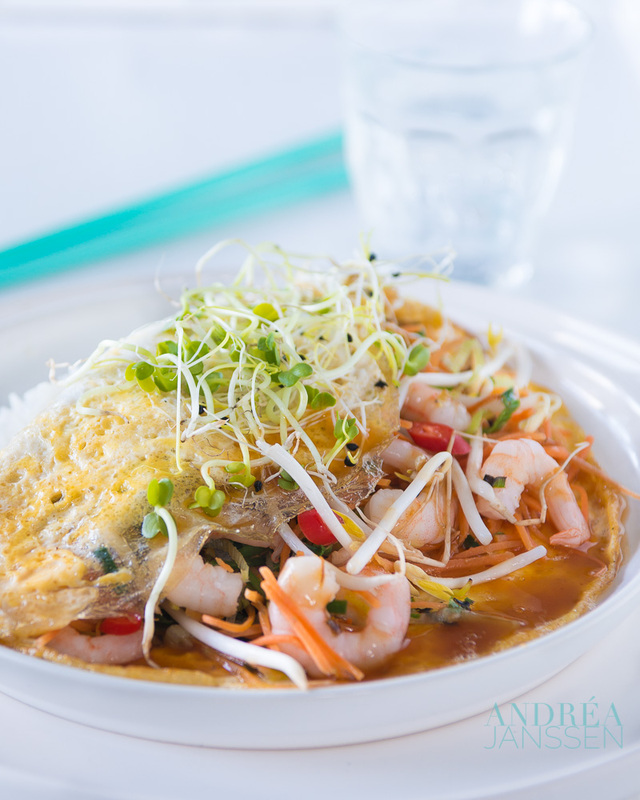 When I was young I could eat from the Chinese take out and one of my favorite dishes was the Chinese omelette. But since my allergies came I can’t do that anymore. And that really isn’t that much fun. I could always look forward to eat it: a little rice, some Chinese omelette with lots of sauce, which really sounds great, isn’t it. So I just decided to take the recipe off my to do list and make it. And that became my contribution to the Food Blog Event. Making the Chinese omelette with sauce was actually quite simple. Of course I was in need of eggs, but just baking the egg with the stuffing gaves so much more flavor. I can’t add mushrooms (because of my allergies), so I let wisely go (but if you fond of them use them, because it’s a great addition) and I stuffed the egg with carrot, leeks and beansprouts. The sauce I made of a bit of chicken broth, soy sauce (sweet) and tomato ketchup that I thickened with some potato flour (but you can use cornstarch as well). Let it bake in the frying pan and finally, after all these years, there was again Chinese egg with sauce on my plate. And … I loved it. It tasted as good as I can remember. And I’m so glad that Sandra thought of this challenge has otherwise it had perhaps been some time before I made it. One of my tips is that you place the omelette in the sauce for just a few minutes before you go eat. The flavor of the sauce will enhance the flavor of the egg and that makes it even better! Add the broth, soy sauce, ketchup and sugar in a saucepan and bring to the boil. In a small bowl, mix the potato starch with the water. Stir it into the sauce and let the sauce come to a boil again and let it thicken. Simmer for another 2 minutes and after that keep the sauce warm. Add the carrot and leeks in the pan and stir-fry for 2 minutes, then place the lid on the pan and let simmer for 3 minutes on low heat. Add the prawns and stir-fry it for another 2 minutes. Then add the bean sprouts. Meanwhile, beat the eggs with salt and pepper and pour in with the vegetable mixture. Reduce the heat to low and cook the omelette until it is light brown on the bottom. Turn the omelette and cook the other side for another 2 minutes. Turn off the heat and pour the sauce on top. Cover and let it stand for 2 minutes. 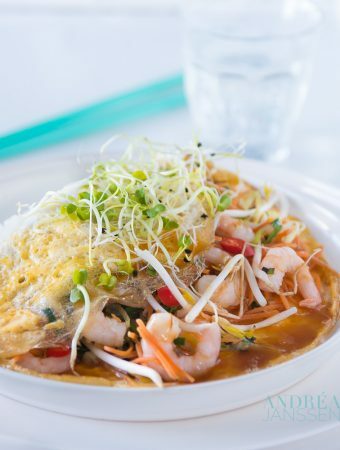 After that you can serve the Chinese omelette with sauce. Our easy Monday recipe today: a healthy meal which can be ready in just 20 minutes. This time I opted for a burger with grilled vegetables and white cheese. And with hummus to complement the white cheese flavor. 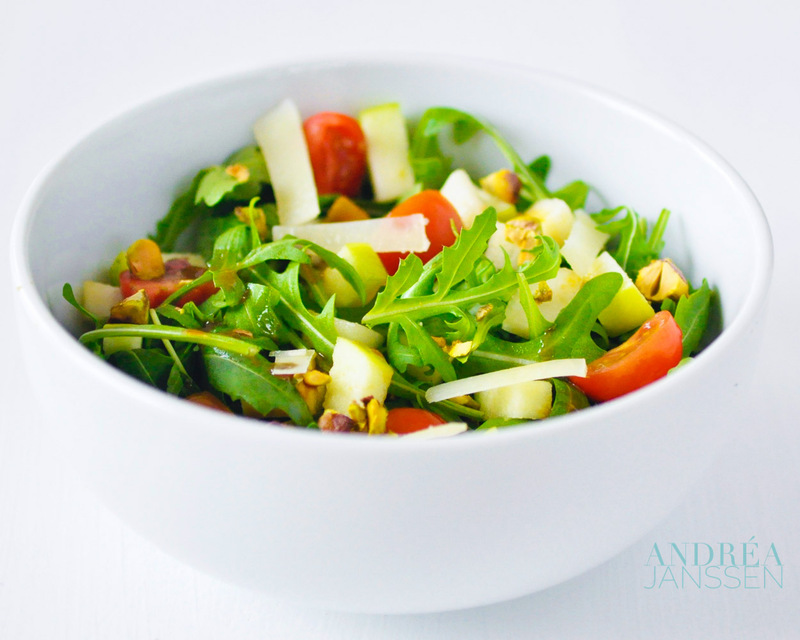 When serving this recipe you can opt for a green salad. Really delicious and healthy. You simply shave the zucchini with a cheese slicer or a peeler. By pre-oiling the vegetables, they won’t burn in the grill pan. You can’t oil the grill pan so do it the other way around. If you don’t have white cheese at home, you can also use feta. This recipe can, of course, also be made on the barbecue. Mix the sunflower oil with salt and pepper to taste. Add the fennel and zucchini and stir well. Heat the grill pan over high heat and fry the burgers first, 3 minutes on each side. Pack them in aluminum foil and let them rest for a while. Grill the pita bread on both sides and cut them open so you get a sack. Grill the fennel and zucchini. The zucchini grill you 1 minute, the fennel 2 minutes on both sides. Divide the vegetables into the opening of the pita bread. Get the hamburger from the foil and put them on top of the veggies. Top with a tablespoon of hummus and sprinkle a little za'atar and white cheese on top. Serve with a delicious salad. 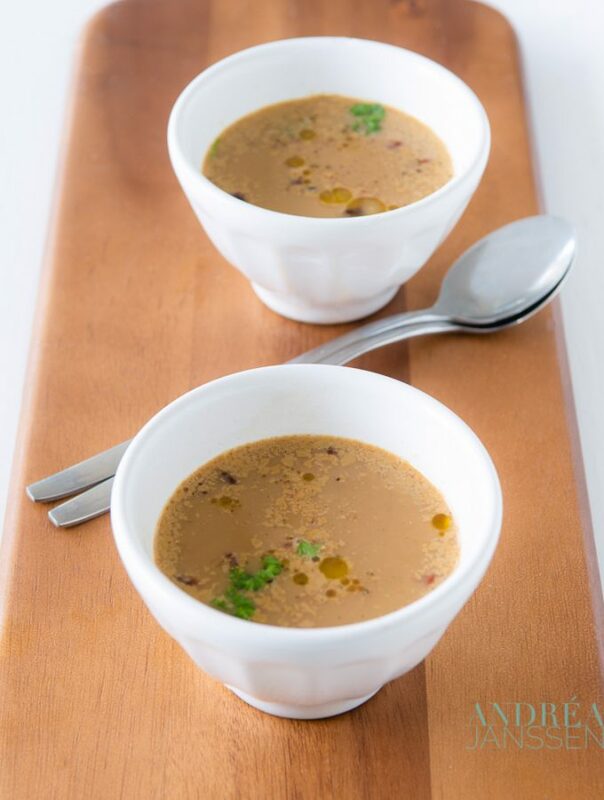 French lentil soup with bacon, do you also see the word French appearing. French as in cuisine, well what does that mean? Further research shows that there is no typical French cuisine, because France is so big, there are various regional cuisines that together make up the French cuisine. Also in terms of ingredients. In the North, for example, they use a lot of cream, butter and apples. In the South of France they don’t and use olive oil, tomatoes and Mediterranean herbs. The country is very vast and almost every region has its own local special products. In short, the French cuisine is very rich. Is there even a typical feature of the French kitchen? Yes, the French are fond of good quality food and have a strong preference to local and regional products as the basis of their meals. They prepare meals from scratch instead of buying fabric-made food. In that sense, it’s a kitchen that fits perfectly with this blog! This book contains about 50 recipes, divided into seasons and in different types of appetizers: soups, vegetables, pasta , fish, meat and spoon amuses, juice amuses, foam amuses and savory appetizers. And it is suposed to serve the amuses before dinner as . As the authors point the amuse-bouche are little bites of food to amuse the mouth, invigorate the palate, whet the appetite. And is made of the best ingredients. So you get great taste sensations. Flavor combinations that are very surprising and very tasteful. The recipes uses cups instead of grams. Put the bacon in a saucepan and put it on low heat, until grease begins to be released. Increase the heat and then fry the bacon until crispy. Put the same pan back on low heat, add the onion, carrot and celery. Toss well ( so that the delicious taste of bacon inherits) and cook, while stirring for 5 minutes. Add the lentils, scoop them around and then add the water. Bring to a boil over high heat and reduce heat to low and simmer until the lentils are tender about 20 minutes. Puree the soup in a blender and strain the soup in the sieve. Put everything back in the pan and on the stove until it is hot. Spoon the soup into a bowl and sprinkle bacon on top. Paper towel; Blender; Coarse sieve. 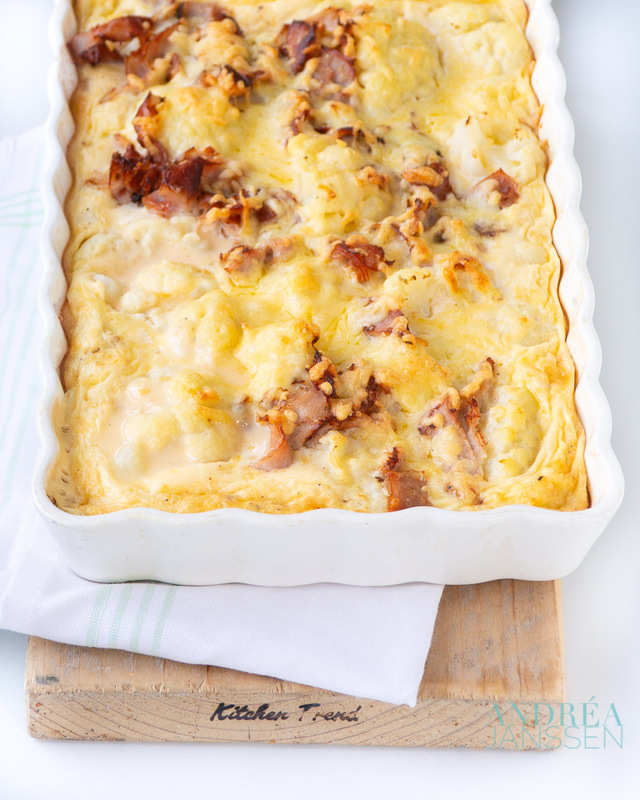 Cauliflower bacon gratin: the creamy cauliflower combined with the salty bacon and cheese. A delicious and savory combination. 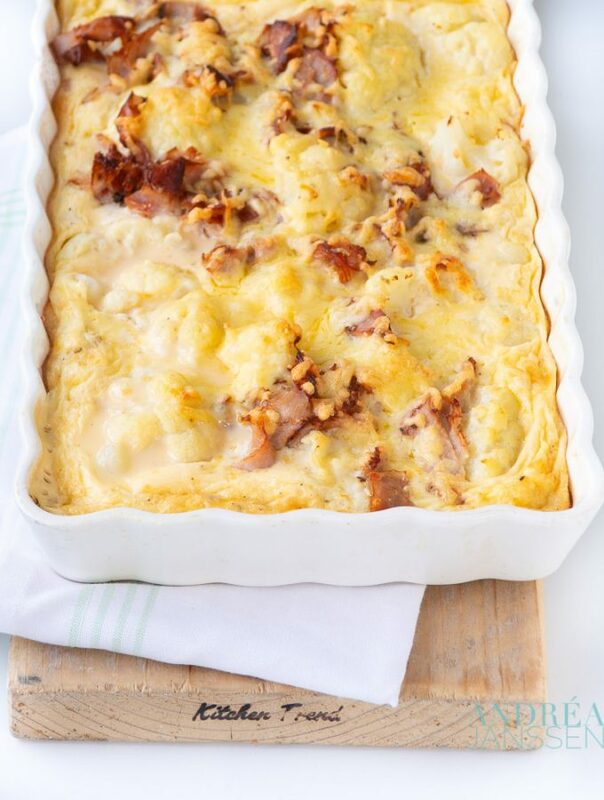 As promised from today’s World Cup special (as long as the Netherlands are still in the race) and we start with a cauliflower bacon gratin (real French cuisine) with grated (Swiss) Emmenthal on top. Because today is the soccer match France – Switzerland at the World Cup program. Then of course this is an excellent dish! The recipe is originally from the book ‘Around my French Table’ by Dorie Greenspan and slightly adapted by me. And it was delicious. This recipe we will definitely make more often! Check the doneness of the cauliflower by stabbing carefully with a fork. The fork should easily go in and out. If that is not the case, then the cauliflower hasn’t cooked enough. Even though a time is given in the recipe, make sure you always check yourself, because given times are guidelines! After adding the cream to the baking dish move it back and forth so you make sure the sauce gets between all the cauliflower. After 25 minutes, check your casserole. If it is not brown enough, then put it under the grill. Don’t bake any longer, otherwise you over cook the cauliflower. Cuts floret of the cauliflower, put them in a pan and cover with a layer of water. Store in the refrigerator until use. Fry the bacon and keep it on a paper towel in a bowl in the refrigerator until use. Grate the cheese and store in the refrigerator until use. Cook the cauliflower for 10 minutes in the boiling water until it is al dente (check that by poking it in with a fork, it should be able to poke well). Meanwhile, bake the bacon in a dry frying pan until it is nicely light brown. Drain the cauliflower in a colander and let it drain well. Butter an oven dish of 20 x 30 cm. Spread the cauliflower florets over the bottom. On top of that you put the bacon. In a bowl, mix the cream with the flour. Beat well until it is nicely thick and has almost no lumps. Then add the eggs one by one while you keep stirring. Finally, pour the milk and 2/3 of the grated cheese and mix well. Season with a pinch of salt, pepper and nutmeg. Pour this batter over the cauliflower and distribute as well as possible. Slide the dish into the oven and take 25 minutes. Keep an eye on it from time to time, when it gets too brown, put an aluminum foil on top to prevent burning. Did you know that the pizza probably descended from a focaccia ? 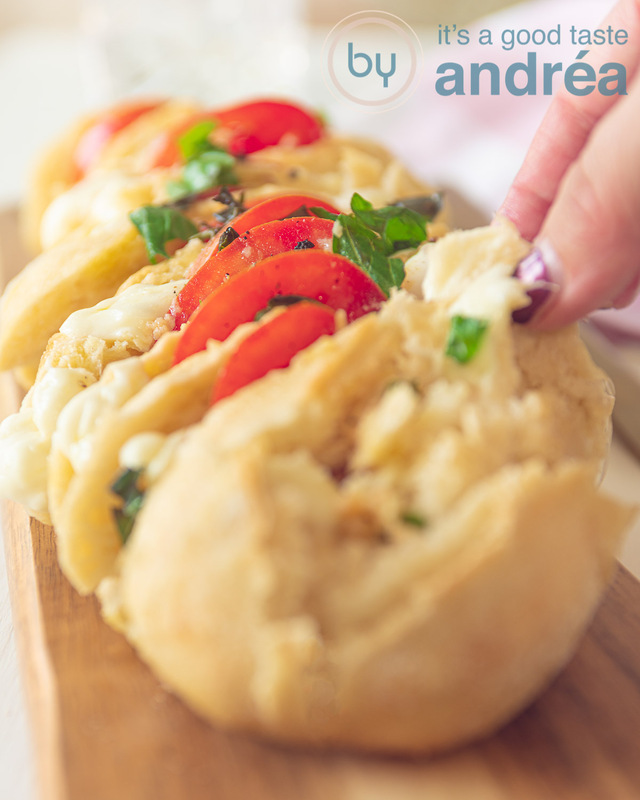 The idea is that these focaccia in the course of time is covered (then with cheese , herbs and vegetables ) and with the addition of the tomato which became the standard topping, the pizza originated. So far history lesson for today. This is one of our favorite pizza. With real cheese of course, which I saw on television isn’t that natural anymore when buying your pizza in the supermarket. We make everything (bottom, sauce) ourselves and, apart from the fact that it takes some waiting time, you don’t have got a lot of work with this recpe. I make the dough in the bread machine , but you can, of course, just as well knead the dough by hand. The tomato sauce just needs some time to simmer and the nice topping is made up by you. Now I live in a house full of foodies and this pizza topping is a favorite with Dad and we call it the Pizza Italian the luxe. 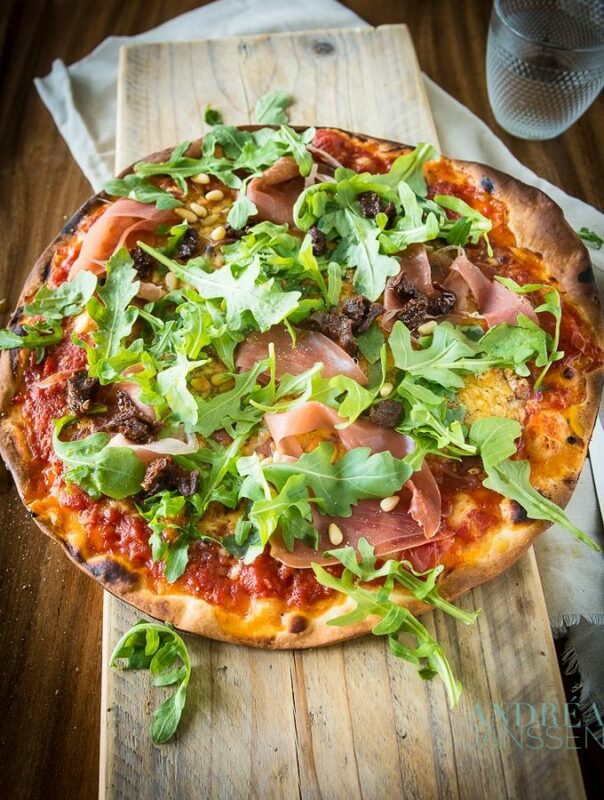 This pizza combines the salty ham, the nutty flavor of the pine nuts, the peppery arugula with the full sweetness of the tomatoes. And all on a crispy base. Of course I’ll give you the recipe below . Put the ingredients for the dough in the bread machine (starting with water and olive oil , then the flour and the other ingredients) and turn the machine on at the dough position, including the 1st rise. When you make the dough by hand or mixer you start a little different. First add the yeast to lukewarm water with 1 teaspoon sugar. Let stand for 5 minutes, add the other ingredients necessary for the dough, and then mix every ingredient for the dough in a bowl. Knead further by hand (or mixer ) for 10 minutes. Grease a bowl with a little oil and place the dough in the bowl and cover it with foil or a wet towel. Put the bowl in a warm place and let the dough rise for 1 hour. Peel the tomatoes by making a cross with a sharp knife in the bottom of the tomato. Dip them in boiling water (about 20 seconds ) and cool them immediately into a bowl of cold water with ice. The skin will now be easy to peel of. Remove the seeds and cut the tomatoes into small pieces. Chop the onion and cut the garlic fine. In a saucepan, warm a tablespoon of olive oil. Stir for 3 minutes, then add the chopped tomatoes, passata and sugar. Put in the herbs and bring to a boil. Reduce heat to low and simmer, while occasionally stirring, for 25 minutes. Remove the herbs from the sauce. Season at taste with salt and pepper. Bake the pine nuts in a dry frying pan on low heat ( about 2 minutes until they have a light brown color and a nutty smell). Cut the sun-dried tomatoes into small pieces. Divide the dough in half and roll each piece out into a round pizza. Let the dough rest for 10 minutes, then spoon the tomato sauce on the pizza and spread it out evenly. Sprinkle the pine nuts, Parma ham and sun-dried tomatoes on the pizza. Grate the cheese and sprinkle it over the pizza and bake for14 minutes in the preheated oven. While baking wash the arugula and make sure it's dry. When the pizza comes out of the the oven, you add the arugula on top of the pizza. Serve immediately! A recipe for a casserole with smoked mackerel, zucchini and mashed potatoes. Surprisingly and delicious. Try it yourself! When I buy a smoked mackerel, I often make a salad for a toast. Or I eat it for lunch with some lettuce, cucumber and paprika. 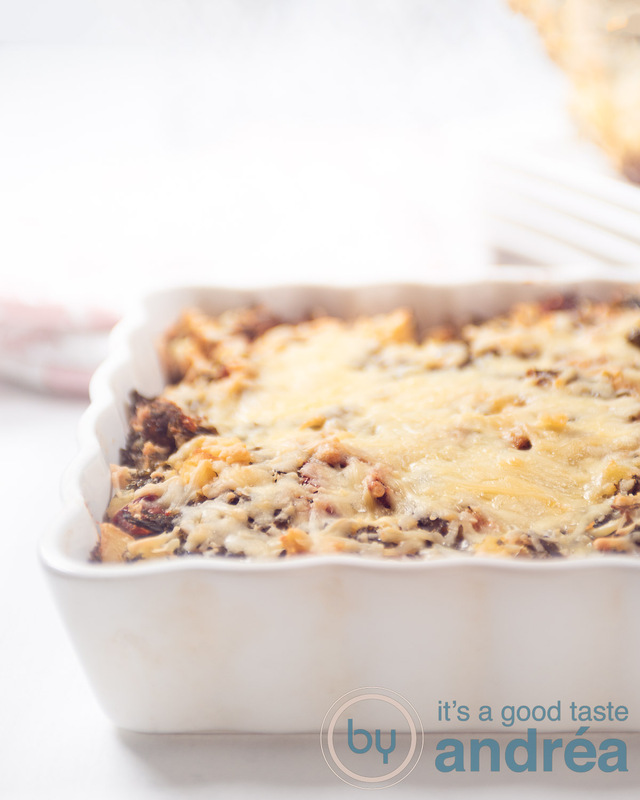 A delicious combination, though, did you know that you can also make this delicious casserole? A casserole? I see you thinking, yes you can! And a very delicious one too. In this recipe you’ll mix the smoked mackerel with Oriental herbs like ginger, garlic and some madras curry spices. Herbs that you might not expect that combine great with smoked mackerel, but which indeed combines deliciously with this salty fish. Then add zucchini and some raisins, a sweet accent, which is a delicious counterpart of the salty flavor. Coconut milk instead of ordinary milk is added too smoothen the mashed potatoes which makes the perfect topping fort this fishy casserole. And when baking and taking it out of the oven, you can smell the scents of this delicious oven dish. Really a top recipe. If you want to make it more spicy, you can add some sriracha to the mashed potatoes. Otherwise, just leave it this way. Mash the potatoes with a masher or a pincher. Rather not with a mixer, because then it looks like glue. Heat the coconut milk before adding it to the puree. Therefor, the mashed potatoes remains airy. Preheat the oven to 180 degrees Celsius and grease an oven dish. Peel the potatoes and boil for 20 minutes. Drain the potatoes and mash them. Heat the coconut milk and stir the mashed potatoes. In a frying pan heat the oil. Add the zucchini, ginger, garlic, curry, raisins and pepper and salt to taste and stir-fry for 3 minutes. Turn the heat off and mix the mackerel through the zucchini mixture. Spread the mackerel mixture on the bottom of the oven dish. Put in the oven and bake for 15 minutes. Juicy beef covered with a tasty duxelles and wrapped in crêpes and pastry. 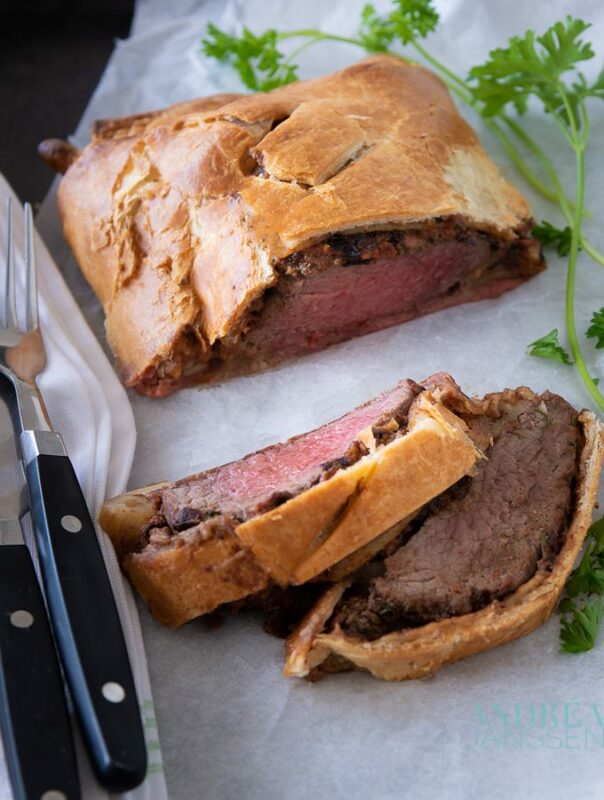 Try this and you know why it’s a classic Beef Wellington recipe. Perhaps you’ve noticed it already, but until recently I was a member of the Daring Kitchen. Until recently, yes, because the Daring Kitchen is no more. The curtain has fallen last December, as there were less and less participants on this project until eventually it was no longer feasible. Sin. And why? Because the beauty of the Daring Kitchen was the “challenger” had done research on his or her project and shared with the group. Then we cooked all together that recipe (with a variation when because of allergies etc. it wasn’t do able) and followed that with a submission. The most fun I thought was experiencing new dishes and flavors which were previously totally unknown or preparing classic recipes which I hadn’t found the time for earlier on. But because I liked it so and in honor of the Daring Kitchen I decided from now on every week to make and blog a recipe from the archives of the Daring Kitchen (cooking and baking), which I have not previously made. 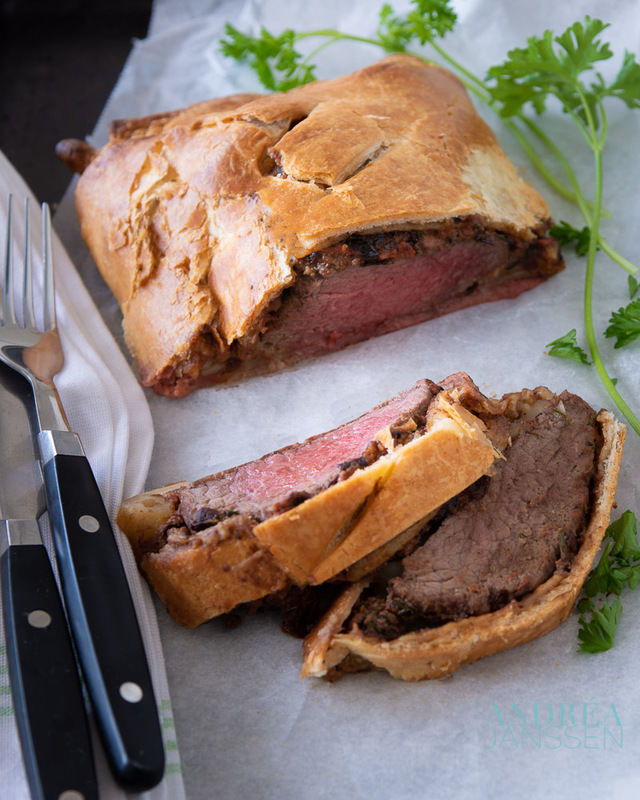 And today is a recipe from September 2009, a golden oldie, a classic Beef Wellington. There was only one problem, The classic version contains mushrooms. And because of my annoying intolerance I can not eat them. Often, and I did this right here, I replace it with sundried tomatoes. So if you don’t have an intolerance and you want to make the real classic version, replace the sundried tomatoes with 100 grams portobello mushrooms. But I can assure you, the replacement of the mushrooms with sundried tomatoes is certainly very tasty variant. By using a crêpe between the meat and the puff pastry, juices are even better contained in the meat and the pastry remains pretty crisp. Crêpes baking is not very difficult, so do not be put off by this. In the original recipe foie gras was used. But you can also just use pate from chicken livers as I did. In this recipe you use beef tenderloin. But did you know that it’s very nice to do with pork tenderloin? Juicy beef covered with a tasty duxelles and wrapped in crêpes and pastry. Try this and you know why it's a classic recipe. Heat a frying pan with the butter and oil. Add the shallots and cook until translucent (about 3 to 4 minutes). Mix the parsley into the duxelles. Make a hole in the middle and break the eggs above. Pour 4 tablespoons milk with the batter, and stir well until smooth. Pour in the remaining milk, while whisking, to dilute the batter. Remove 1 tablespoon butter in the pan and mix it into the batter. Pour 4 tablespoons of batter into the pan and swirl the pan so that the batter is well spread over the pan. Bake the crepe about 1-2 minutes at that side and then turn it over. Bake for another 30 seconds. Then remove the crepe from the pan and keep it on a plate until further use. Pat the meat dry and season with salt and pepper. Place the steaks on a plate and let cool to room temperature. In a bowl mix the pâté and the duxelles with a fork until you get a paste. Lay a crêpe in front of you and spread a little layer pate on top. Place the steak in the middle and fold the crepe around. Cut the excess crêpes away.